Dr. Bradley's presentation style is uniquely engaging and has won the acclaim of groups from 5 to 500. Executives in a Fortune 300 financial services firm found Dr. Bradley to be such an effective speaker that they asked her to offer training on "How to Wow an Audience" as part of their marketing strategy. Meeting planners describe Dr. Bradley as a great listener who is adept at customizing her presentations to the audience and the objectives. Organizations book her engaging, interactive speeches when they want to re energize members or provide tested strategies that lead to greater productivity and satisfaction. Clients have used speeches on how to get rid of excuses to build their brand. They sponsored presentations to help them attract and retain valuable clients. Speeches based upon Wouldacouldashoulda: Rapid Results. No Excuses. have been featured as keynotes, centerpieces of orientation sessions, presentations at retreats, and programs for a wide variety of associations. 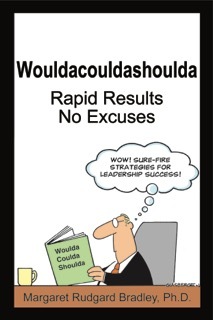 Copies of Wouldacouldashoulda: Rapid Results. No Excuses. are available at quantity discounts so every member of the audience can have book.